In today's world the most important tools for tuning are no longer found in your toolbox. Just think, in the 1980's Top Fuel dragsters made 2500 hp using a 500 cubic inch ( 8.2 Liter) Aluminum Hemi headed engine, as amazing as this might sound, today this same displacement and very similar looking hemi headed engines are making over 7000 hp! Why? It is all about optimizing all aspects of the engine to improving efficiency. This demands the tools to gather data so you can understand what is happening inside the engine and identify opportunities to improve efficiency. 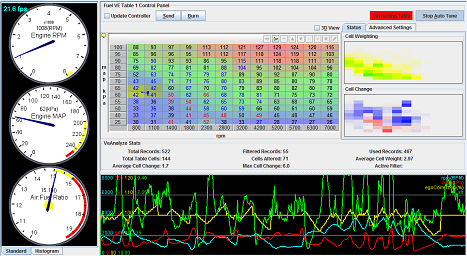 Together TunerStudio and MegaLogViewer bring you the power to capture, view and analyze data as your engine produces it, then act upon it. These easy to use applications simplify making changes and even offer recommendations and automatic correction using data analytics at a level that is not offered by any other tuning solutions. With a simple online registration you can Unlock all the features of TunerStudio MS in minutes! Whether you want a more powerful tuning aids, improved diagnostic tools, dedicated Car PC dashboard, or built in data analytics to tune the car for you; the registered version of TunerStudio MS brings it to you! Make Payments via Credit Card or PayPal and you will receive a registration code via email within minutes! The standard software for tuning of your MegaSquirt. With EFI Analytic's long standing support of the MegaSquirt Community, this version of TunerStudio brings the MegaSquirt community the most feature rich and refined tuning software ever available, making setup of your MegaSquirt simpler than ever. TunerStudio MS is the only application to support ALL MegaSquirt firmwares. The only way to simplify your tuning even further is to check out the advanced features of the registered TunerStudio MS.
Once downloaded, you can get a registration to activate more features if you want. No need to reinstall anything or change anything with your projects, Just enter the registration information to activate the additional features. This is purely voluntary, but supports the ongoing development of TunerStudio. Tabbed Dashboards - Add as many dashboards as you wish allowing yout to quickly change views depending on what you may be working on or to provide different look in a snap. Gauge Styles - A growing list of available Gauge styles gives you the power to create dashboard designs limited only by your imagination. Additional Gauge Styles can requested any time you think of one. Full Screen Dashboards - With a simple double click or selecting from the menu you can make any tabbed dash go full screen. You can even set it up to go straight to full screen on startup. Dashboard Designer - Modify any dash in a snap or build your own from the ground up with designer mode. Designer mode gives you a full WYSIWYG drag and drop interface allowing you to place gauges anywhere you like. You select the styles, limits, fonts, colors, titles and text. You can save and share your work or just show it off. VE Analyze Live! Tune For You - Yes it really does tune the car for you while you drive! Starting with concepts of VE Analyze in MegaLogViewer 2.95 and taking it to the next level with dynamic offset record seeking. 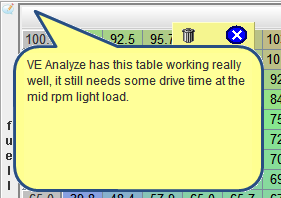 Whether your just running with rough tables or have already put hours into your tune, VE Analyze Live will dial in your fuel tables to a new state. Why does it work so well? By combining a vast tuning experience with expertise in data analytics you can leverage technology to improve your tune. An expert tuner can look at a data log record and know what changes that record is looking for, but one record can only tell so much. At best a record only shows the inputs and results at that instant in time with many other outside factors effecting the data. 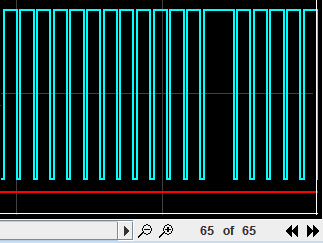 There have been several poor attempts at creating auto tune functions, they just don't consider all the data. In reality a well designed autotune based on analyzing data with a computer will just do a better job that a human can. There is a big if to this.... The Auto tune needs to consider all the factors a knowledgeable human would. Most auto tunes are overly simplistic and don't consider all the factors a knowledgeable human would. This approach can get you started but will never do a better job. 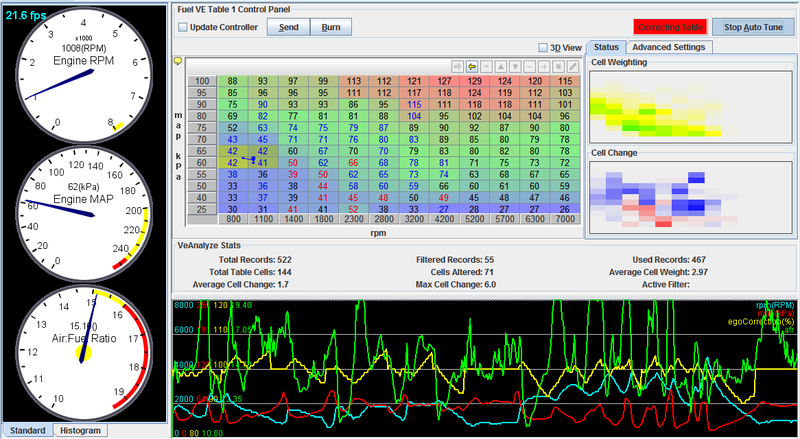 VE Analyze looks at all the key factors that I do after 25 years of tuning with the manual approach. However, My human brain can not hold thousands of data points at once and produce the statistical averages :) This is a huge advantage. 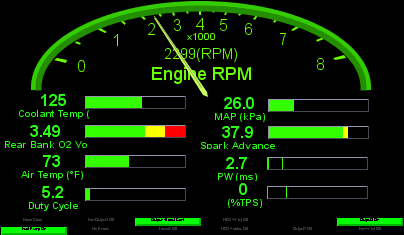 VE Analyze successfully implements this tuning knowledge with the capabilities of the computer to produce automated tuning unmatched by any other program available for aftermarket EFI controllers. Automatic update to controller - You can either have TunerStudio produce a recommended table as you drive, or let it acutally send the updates as you drive to continually improve you tune while going down the road. Adjustable Standard Filter - In addition to TunerStudio filtering data with lack of credibility, you can adjust standard parameters such as RPM, Coolant temp, load, MAP, MAF to match your configuration or preference. Custom Filters - One of the Standard Filters doesn't cut it for your setup? The custom filter lets you apply free form logical and mathematical formulas to filter nearly any data you desire. Lambda Delay Table - Compensates for delays to your Lambda Sensor readings caused by not just the Lambda sensor itself, but more importantly the time spent flowing through the exhaust pipes under varying conditions. 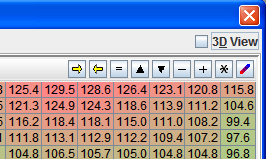 Heat Maps - As you drive you can see how much data has been gathered for all sections of the table and how much the table values have changed. Authority Limits - Allow you to limit the amount of change TunerStudio can make in a single session to prevent damage if something goes wrong. Full Readouts - Watch the major data elements as TunerStudio uses them with a gauge cluster and histogram to show just what your engine is doing. Upgraded Ignition Logger* - The Ignition Logger lets you graphically see the signal your crank trigger wheel produces in as the controller sees it. 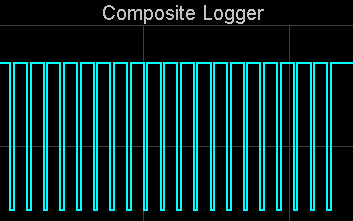 Depending on your firmware Tooth Logger, Trigger Logger, Composite Logger and the Sync Logger help to quickly identify problems in your ignition sensor or circuitry. *Ignition Loggers are only supported by MS1Extra, MS2 Extra and MS3 Firmware. Log file loading and viewing - Open captured logs with up to 100 pages of data. 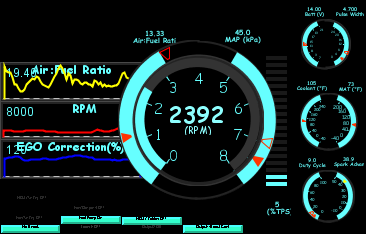 Specialized Gauge Cluster - Current engine parameters are dsiplayed in parallel with the composite logger as histograms, or any other layout you may choose. Difference Reporting - No more guessing what you changed in that file, just look at the difference report an see the settings side by side easy to read with the differences highlighted! Compare on connect - As soon as TunerStudio connects to your controller it will chack to see if you have made any offline changes since you were last connected, present the differences side by side, and let you select which ones you want to keep. Compare loaded Tune to saved one - Instantly see exactly what changed between the tune you have loaded and any other msq you may have with a side by side visual view of settings that don't match. Setting Notes & Comments - Take notes while tuning and configuring for yourself or any one you may be sending the msq to. A note for nearly every setting - A quick note of why you set something the way it is, or what you might still want to try next! Saved to your Tune File(msq) - These notes and comments are saved with your msq so they can be reviewed any time in the future or will be there if you share your msq with others. Additional Tuning Aids - Throughout the Full Edition of TunerStudioMS you will find additional features and settings to make life simpler while tuning. Adjustable 2D table tell tail - Blue line and dots to show the path through the map you have taken. The number of records is configurable. 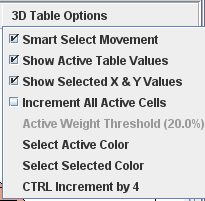 Improved 3D Tables - Configurable increment sizes, accented value changes, more user settings. Switchable 2D to 3D View - Snap nearly any table to 3D view mode to gain quick insite with a different perspective. Plus more - This list continues to grow with active development rapidly continuing!